How about another pretty art print from this artist? Aren't these art prints gorgeous? I absolutely love and them everything else in this etsy shop. Anyhow, inspired by the bright colors, I made some very bright shoes. They are bright, they are fun, and because they incorporate so many colors, they can match so many different outfits. I'm not so sure I am selling them. Tessa could use them. However, if you beg I might make a deal since they don't fit her yet. They are size 4 and 4.75 inches long. 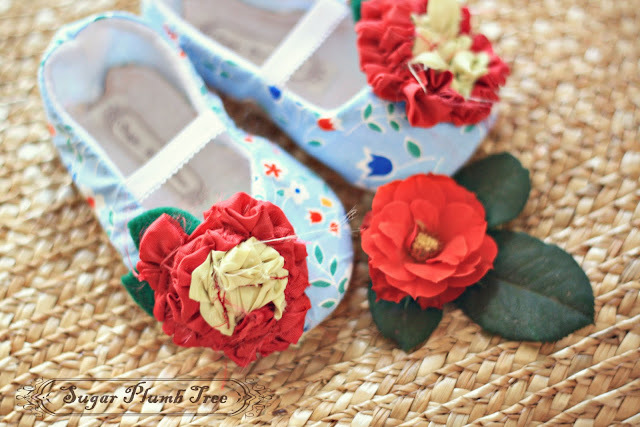 These shoes keep getting cuter and cuter!